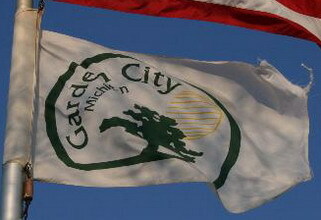 "Garden City is a city in Wayne County of the U.S. state of Michigan. As of the 2000 census, the city population was 30,047. The city is part of the Metro Detroit region. The flag is white with a logo consisting of green circle, inside it a green tree and a sun disk made of a gold circle and gold horizontal lines.